I've just skeined this up, and I thought I'd share - it's for a non-craftster swap (but, yeah, Harry Potter) so hopefully my partner won't see it here. 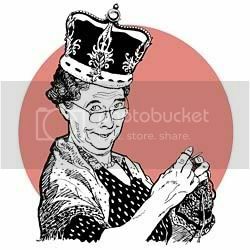 I'm using Knit Picks bare fingerweight yarn and lanaset dyes. And before you say it's not the right green for Slytherin, it's not, but I think it's the right one in the project. A darker green would have been shocking, I think, with all that yellow/gold/bronze, red, and black. 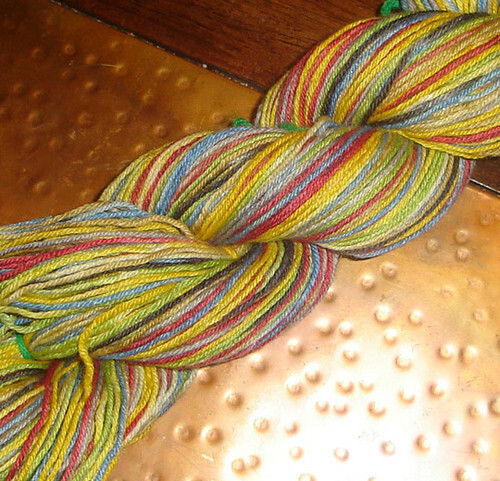 Alright, here's the deal about self-striping sock yarn. There's some disagreement as to how long it has to be, but I got my numbers from Vildhavre's tutorial https://www.craftster.org/forum/index.php?topic=188946.0, because god knows I only knit as a last resort. One side is really a stake, the other is a fence post. I am walking along inside the loop to be sure I don't mess it up. It needs to be a big open loop. As you'll see. Once all the yarn is in the big loop (it's about 12 passes), every thing is tied, and I made ties every two or three yards. And the more ties the better, people! I'm terrified of tangles. Then I freed one end, and began to make interior loops of about two arm-lengths each, which are tied off themselves. 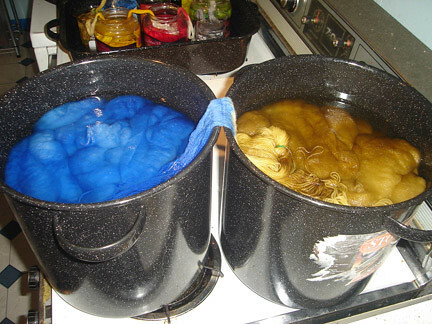 Then they are soaked overnight and then put into jars with vinegar and dye, and heated in a pan of water for half an hour or so... covered, to keep the steam in. Let it cool, rinse it out (several times)... let it dry. And then you see how well you tied it. Then it's back on the stakes to be untied. 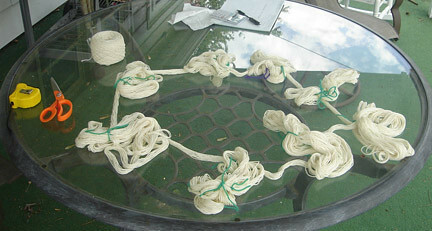 And then twisted up into a skein. 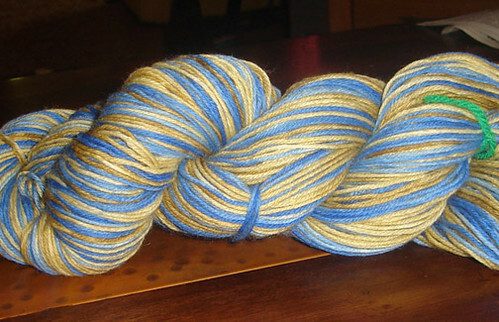 And the other thing is that I'm doing some just in Ravenclaw colors. It's two colors, so, a much shorter loop. 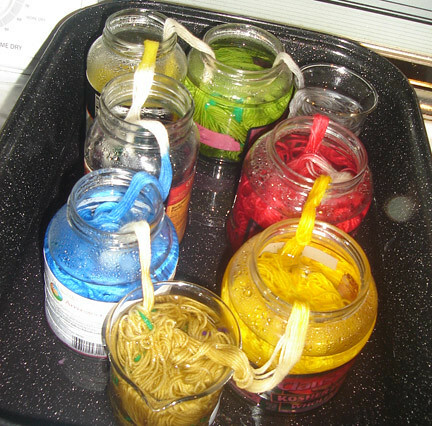 And it was dyed in a pot with roving and other yarn, but otherwise just like the jars, but on a bigger scale. It's fun, despite all the winding and unwinding, I'm already planning lots of non-Harry Potter related colorways. That is fantastic!!! I love the colors! Awesome! I think you should join the HP swap here so that I can be your partner and get myself some of that striping goodness. I'm sure your partner will love it! This gives me a whole new respect for self-striping yarns. Seriously - you are amazing! Wow! Not only wonderful work, but totally cool that you offered up such great intruction. Makes me wanna go try it myself. Thank you! Wow!! that's awesome! I love the colours! wow. I never knew how they did that... it's so deceivingly simple! I learned something today. You just TRY to get me away from my sewing machine. Thanks for all your comments guys! It was something I was desperate to try, but worried about, but turned out to be really fun. And everyone should do it. The same thing is completely workable with kool-aid or wilton cake icing dyes. Thanks! 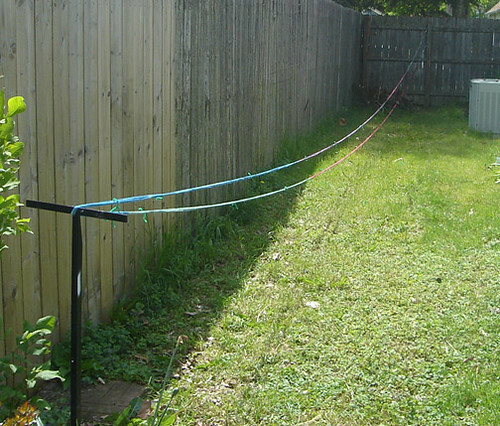 Although, it's convenient to have a yard, it's really just a matter of finding a way to make the distance in whatever area you have available. If you look at Vildhavre's tutorial, she did it on chairs, just going around each one several times before moving on to the next... 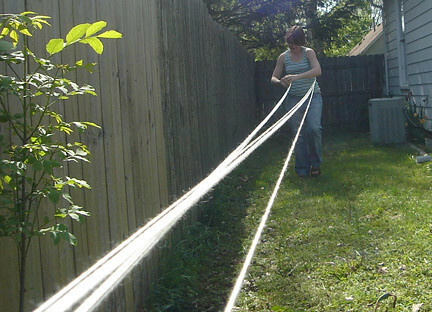 I mean, it's like warping for a loom. 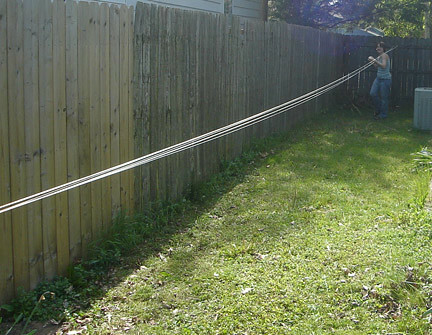 You can do it in a straight line, or on a warping board where you go all over to make you loop. For the second, I was thinking about wrapping a table, but while I'm still pretty sure it would have worked, I couldn't quite convince myself, so I went with two chairs, instead.